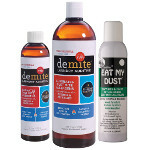 DeMite® Laundry Additive was created in the mid 1990’s by Larry and Shirlee Kalstone as a response to studies showing that dust mite allergic patients should wash all bedding in very hot (140° or hotter) water to eliminate the source of allergens – the dust mites. Around that same time, there were also studies that indicated that adding benzyl benzoate to the wash water would accomplish the same thing but without the need for extremely hot water. The Kalstones knew what most homemakers know about washing fabrics in very hot water. They knew that fabrics both fade and degrade in hot water washing and that turning your hot water heater to temperatures as high as 140° could also cause scalding. Additionally, it is very expensive to keep water heated to 140° in your home. However, without hot water or a laundry additive, less than 10% of mites were killed in normal washing cycles. 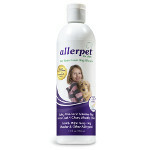 The goal was to create a product that would accomplish the elimination of dust mite allergen and the source of that allergen in any temperature wash water, so that hot water was not an essential element in reducing mites and their allergen in bedding – sheets, pillow cases, blankets and other top-of-bed covers. 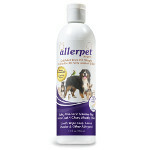 The result was one of the most effective and popular allergen avoidance products (second only to allergen barrier mattress and pillow encasings) available to dust mite allergic patients and their families. *PLEASE NOTE: The links above will take you to our Allerpet Website in a new tab/window.